So, when it snows, I pull out the stamps! 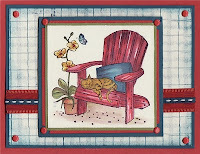 I couldn't decide whether I like the Ruby Red adirondack chair or the weather natural one -- you tell me. I've been wanting this set for ages, so it's been fun to play with it. I layered Ruby Red, Not Quite Navy, Vanilla and Old Olive. 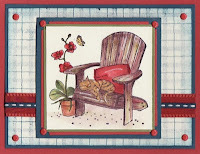 The plaid layer is stamped with Not Quite Navy craft ink using Stipple Plaid on Vanilla. Sorry for the use of such an old background stamp, but the new backgrounds are just not sufficient, imho. You can never have too many background stamps! Now this is tough!! I love both, but will go with the red as it has a touch more shading. I should have this stamp set, I love it. I agree with you, I love my background stamps and use them all the time. I don't care a hoot if they are discontinued.